Perfectly situated for Valentine's weekend, this wonderful animated tale uses William Shakespeare's inspiration and Elton John's music to tell the story of gnomes that overcome the prejudices of their gardens to forge a bond. This charming ‘toon was left over from the Miramax regime but kept for release by parent Disney Studios and its Touchstone label. It certainly has the feel of the Mouse House and should benefit as the first big 3D animated event of 2011 by scoring big at the box office and beyond. Kids will fall in love with it as a movie treat full of heart, laughs and fantastic songs, and it could have crossover appeal as a Valentine date night treat thanks to all its pointy-hatted romance. Humans Miss Montague (Julie Walters) and Mr. Capulet (Richard Wilson) are uber competitive about their outdoor yard fetishes. They collect gardens of Red and Blue gnomes who carry on their prejudices in their absence, battling each other without regard to anything but physical appearances. Caught up in the middle of this mess are the bright and spirited Gnomeo (James McAvoy) and Juliet (Emily Blunt), whose budding relationship causes problems because they come from different gardens. Set in Shakespeare's birthplace, Stratford-Upon-Avon, this well directed ‘toon by Kelly Asbury (Spirit of the Cimmaron, Shrek 2) is sometimes too cute for its own good. Gnomes are, quite frankly, a little difficult to warm up to as animated characters, but here they are so charmingly voiced by the film's A-list cast that we can forgive almost anything. 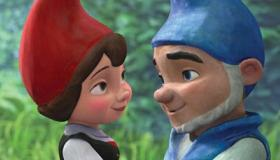 The supporting cast is filled with notables including Michael Caine as Juliet's father, a cunning Jason Statham as Gnomeo's nemesis Tybalt, Ashley Jensen is Juliet's best friend Nanette, Matt Lucas voices Gnomeo's best bud Benney, and in smaller roles are Maggie Smith and Patrick Steward lending gravitas to the enterprise. Dolly Parton has a fun little bit as the country gnome, Dolly (what else? ), who starts the centerpiece lawnmower races. Best of all is Jim Cummings as the poignant, plastic pink flamingo, Featherstone. His story of love found and lost is the emotional lynchpin of the film and its sweetest moment. Still the film lives or dies on the shoulders of Elton John, who not only provides many of his golden oldies as the meat and potatoes of the soundtrack but also offers up a couple of perfectly sweetened new tunes to add to the fun.